Looking for baby-friendly holidays? Here’s some great advice on why it’s never too early to start travelling with your children. I will also give you suggestions on where to go and how to plan your trip, and recommend the best companies that will ensure you not only have a fun and stress-free holiday, but also get some all-important ‘me time’. Also see our tips on going on holiday when pregnant. Should I go on holiday with a baby? Of course you should! Babies are not only perfectly portable, but they also usually travel free of charge. 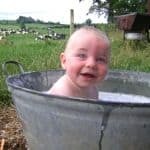 They can’t dictate where you go or what you should do (make the most of it while it lasts) and locals in most countries will make a big cheek-squidging fuss of them – which can be a huge morale boost for weary new parents. Choose the right holiday and you can even get some well-deserved parent pampering. Reality check? We’ve all been there. New parents are stalked by fatigue; they’re sleep-deprived, irritable and can barely summon the energy for a trip to the shops, let alone get their heads around a family holiday. And then there’s the ‘raised eyebrow’ brigade – those unsympathetic fellow travellers who seem generally peeved by the mere presence of anything in nappies. There are also practicalities to consider. Babies are unable to communicate when things are wrong (except through the obvious medium of bawling) and you need to be extra-vigilant with things like sun, heat and water. Ultimately, though, the art of happy, successful baby-friendly holidays has been beautifully refined by a caring bunch of travel operators, offering everything from self-catering cottage breaks to mollycoddling at luxury resorts. Note: if you are looking for childcare, check out our pick of the best holiday kids clubs for babies. If your priority is minimum fuss, minimum travel and minimum disruption to hard-won sleep and feeding routines, then stick to the UK. Cornwall has several equally baby-friendly places to stay. I recommend Sands Resort Hotel in Porth, near Newquay. It really pushes the boat out for new parents, providing everything from family suites to free bottle warmers, sterilisers and a baby-listening service. Also on Cornwall’s invigorating north coast, Gwel an Mor offers a luxurious self-catering option with its fabulous timber lodges, onsite spa, restaurant and wildlife centre. With all the expense that comes with starting a family, many new parents are understandably counting the pennies. A self-catering cottage holiday offers excellent value, particularly outside the school holidays. Classic Cottages have around 120 baby-friendly properties in the West Country and the Isle of Wight, while Helpful Holidays offer the best selection of cottages in Devon. Sykes Cottages are a good bet for those parents happy to pop baby in a papoose and head for the fells of the Lake District. Also check out Rural Retreats. How about piling everything you need into the car – from jars of baby food to bales of nappies – and setting off for a self-catering break in a villa or holiday village? Travel to France in the shoulder seasons of May-June or September-October and you not only sidestep peak-season price hikes, but also avoid the gripe-inducing heat of July and August. If the prospect of long car journeys with a fractious baby strapped in the back fills you with dread, try Siblu Villages. They’ve got great-value holiday villages throughout France, including several just over the Channel in Normandy and Brittany. Siblu’s Bubbles club provide non-stop fun for littl’uns as young as one, while baby essentials (like cots, high chairs and buggies) can be pre-booked if you want to cut down on the packing. For something more luxurious, try the wonderful all-inclusive resort experience at Club Med. Its Baby Club Med welcomes babies from 4 month up to 23 months. See the latest offers. Of course, there is another way to ensure high-quality babysitting on holiday: take the grandparents with you! In fact, by staying at one of the properties offered by The Big Domain there will almost certainly be room for both sets of grandparents and perhaps some aunts and uncles as well. For something more modest, try Vintage Travel with its fine portfolio of self-catering villas in northern Spain. The long ferry ride to Bilbao or Santander will appeal to parents wary of taking their babies on flights, while the Basque coast has some lovely sandy beaches that are generally less crowded and sunbaked than their costa counterparts on the Mediterranean. That’s not to say we’re ruling out the Med for baby-friendly holidays. Far from it. As long as you take sensible precautions against sun and heat exposure – especially if you have to travel during mid-Summer – the Mediterranean is gaga with baby-friendly villas and resorts. 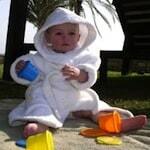 Menorca is an example of a great destination for families with babies. 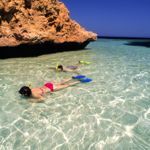 Airport transfers are short, the beaches offer calm shallow water for paddling and you’ll find many well-equipped villas. Brownie points for Vintage Travel, which lists villas with fenced pools – an essential requirement if you’ve got a baby that’s discovered the liberating joys of crawling. Also try Cachet Travel for villas on Crete, and Oliver’s Travels for family villas in the Dordogne and on the coast or in the countryside of Croatia. Other parents will appreciate Scott Dunn’s choice collection of staffed villas in Portugal – each one with its own chef, host and nanny. Another luxury option is Sir Richard Branson’s new Son Bunyola estate in Mallorca where each spacious villa has its own private chef, along with a full concierge service. Babies are welcome and there is a babysitting service, but no nannies. If it’s a fully-fledged resort you’re after, I can’t fault Forte Village on the southern tip of Sardinia. A cluster of eight hotels, it offers just about every leisure facility and childcare option you can imagine – a paradise for kids of all ages and a total break guaranteed for parents. See the latest special offers. Boasting an Ofsted-accredited crèche, the Sani Resort on the Greek peninsula of Halkidiki is another leading family resort in the Med, while the five-star Daios Cove on the island of Crete has a renowned Scott Dunn Explorers club where babies as young as four months can enjoy fun and games with qualified childcare professionals – not to mention a complimentary supply of swim nappies. The Westin Resort Costa Navarino on the Greek mainland has great facilities for babies, and the creche takes children from four months old. Also on the Greek mainland, in beautiful Halkidiki, the IKOS Olivia is a family-friendly all-inclusive hotel with sensible prices. Its creche takes babies from four months. Slightly further afield, the Canary Islands are a great year-round destination, with a wide choice of baby-friendly accommodation. Our top picks for parent pampering and family facilities include Lanzarote’s Princesa Yaiza Hotel and the Ritz-Carlton, Abama on Tenerife. Plan with military precision for a long-haul flight with your baby. Request bulkhead seats where skycots can be fitted and don’t forget to pack all baby essentials in your hand luggage. Feed your baby on takeoff and landing to reduce discomfort caused by changes in air pressure and don’t be afraid to ask flight attendants for help, warming baby food etc. Try to travel outside the main holiday seasons when airports and flights are less busy – and fly direct. Not all of the islands in the Caribbean, for example, have non-stop flights from the UK or Europe. 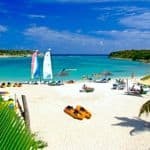 Beaches Resorts, however, feature properties on Jamaica and the Turks & Caicos that are served by direct British Airways flights from London. Beachcomber Tours’ superb line-up of family-friendly hotels on Mauritius offers an Indian Ocean alternative – great weather, warm seas and no jet lag. For more ideas please visit 101 Family Holidays (you can select “babies” on the homepage). See these expert tips on flying with children. And don’t forget you will soon be needing advice on holidays with toddlers. If you’re still not sure where to take your baby on holiday, why not try our family holiday quiz. Answer a few fun questions like the one below and we’ll tell you what kind of family you are, and give you a selection of personalised recommendations. Try the quiz now.